Create a map of hurricane trajectoriesusing the NOAA weather data with the query in this tutorial and BigQuery Geo Viz to plot it. How does three-point shooting accuracy change at the end of NCAA basketball games? This query compares three-point shooting accuracy from NCAA men’s and women’s basketball games in the first 35 minutes and the final 5 minutes. Learn more at the NCAA Basketball Marketplace Page from BigQuery Public Datasets. 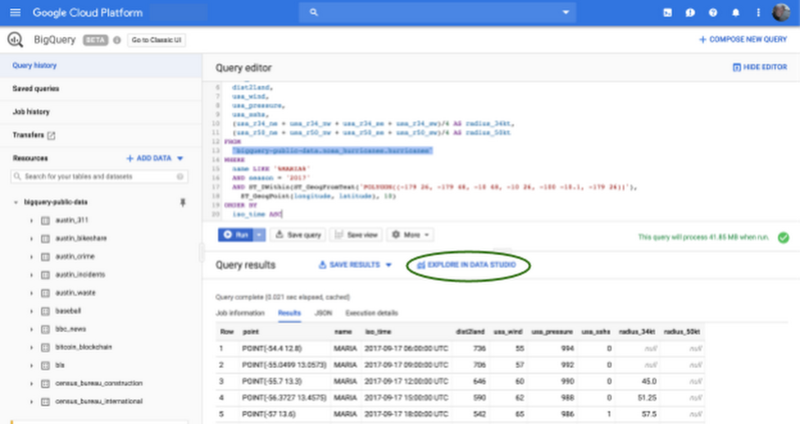 The BigQuery team is keen to hear what you choose as your first query. Please let us know what your first query was by tweeting with the hashtag #bqsandbox. To learn more about BigQuery, RSVP for the BigQuery BBQ in a city near you, where you’ll cook up some exciting data insights over delicious food and win prizes. You’ll be joined by Google Developer Advocates Felipe Hoffa and Minhaz Kazi, to solve our data challenge contest using public datasets available in BigQuery.